For many years, South Africa has been one of the top best value for money holiday destinations. With the South African Rand being fairly low, it makes South Africa even more attractive to Australian travellers. South Africa is a country where you really do get the best of both worlds. From cityscapes and panorama routes in Johannesburg to waterfronts and beaches in Cape Town. You’ve got the gorgeous Franschhoek and Stellenbosch winelands, the outstanding safari lodges and incredible wildlife in Kruger, Sabi Sands and the various other national parks and private reserves. Accommodation in South Africa is world class and probably the best value for money across Africa. Whether it’s 3, 4 or 5 Star lodges, you will definitely not be disappointed by the service, food or experience of your stay. We’ve put together a 14 day Best of South Africa itinerary that includes our favourite South African spots including Johannesburg, Kruger, Cape Town and more. Or if its a Family Safari you are looking for check out our 11 day South Africa Family Safari. A microcosm of Africa, Kenya features more than fifty of the world’s most breathtaking national parks and is home to some of Earth’s most vulnerable wildlife. Truly a country like no other, Kenya is a marvel of wildlife and culture. One of the many reasons why Kenya such good value for money is the vast open plain National Parks. The Masai Mara for instance is over 1,000km² and is the place to be during the spectacular migration where over a million wildebeest accompanied by Zebra, antelope and various predators make their way across the Mara River. Even if you’re not there during the migration, the Mara is still a wildlife hub, with strong numbers of elephant, giraffe, hippo and an incredible array of plains game, interspersed with breathtaking sightings such as a lone cheetah perched on a termite mound or a leopard up a tree. Kenya is so much more than just the Mara, there’s Lake Nakuru, with thousands of flamingos and the only place where it’s virtually impossible not to see a square lipped or round lipped rhino. While Kenya offers superb wildlife, its important to mention that it also offers gorgeous beaches in Mombasa. Accommodation here is very affordable offering great value. Mombasa boasts a deep history and offers a great selection of cultural tours. We’ve mentioned a few highlights of Kenya, but there is so much more than this to see and do. It is all very affordable and offers amazing value. Zimbabwe has recently been working hard on promoting tourism. There are new lodges opening across Hwange National Park. Victoria Falls is now not the only thing people come to Zimbabwe for. A great place to start is Victoria Falls; the most breathtaking waterfalls you will ever witness. It’s honestly no surprise that Victoria falls are one of the Seven Natural Wonders of the World. It’s the largest waterfall on earth, combining height and width to make it the largest single flowing sheet of water. There are plenty of lodges close to the falls at a range of price points. The quality of accommodation and service wherever you go is of an exceptional standard and excellent value. Zimbabwe used to be the place to see Victoria Falls before heading out on safari. But now you can do it all in one country in the outstanding Hwange National Park. Zimbabwe’s largest national park is over 14,000km², it is also one of the most wildlife rich national parks in all of Africa. Hwange is free from large crowds and is the place to be if you want to see large herds of elephant. Hwange is actually home to one of the world’s largest elephant populations. If you’re not a fan of elephants, don’t worry; Hwange boasts hundreds of bird species and multiple antelope species. If its predators you’re after you will find the lion, leopard and even the wild dog are seen regularly. What really makes Hwange so special is that there are very few visitors and because the park is so large, it’s mostly just your vehicle in the park as far as the eye can see. There are quite a few accommodation options in Hwange which are perhaps a little pricier than other Reserves in Africa however you get outstanding value for money in terms of wildlife viewing and amenities. Be sure to take a look at our Best of Zimbabwe itinerary and the range of accommodation options we have in Hwange National Park. Much like Zimbabwe, many people visit Zambia only to witness Mosi-oa-Tunya (the smoke that thunders) otherwise known as Victoria Falls. This of course is fairly upsetting but truly adds to the exclusive and intimate experience of not having dozens of other vehicles blocking your view of the spectacular wildlife. Approximately 30% of Zambia is reserved for game management and national parks; there are twenty national parks and 34 game management areas across the country. Our favourite and what we believe to be the best value for money national parks are South Luangwa and Lower Zambezi National Park. Both these parks host an abundance of wildlife and offer superb accommodation. South Luangwa is home to over 400 bird species and 60 different animal species. It has the highest concentration of game than any other national park in Africa. If you love leopards, South Luangwa is the place to be; there are strong numbers of leopards, and almost everyone that visits sees at least one or two leopards (usually more). It is at South Luangwa where you can go on amazing walking safaris; an experience that can’t be experienced everywhere in Africa; walking through the bush and experiencing the African wilderness in the most natural way: by foot. Lower Zambezi offers walking safaris, game drives all with expert guides, making your visit that much more special. A visit to Lower Zambezi is of course not complete without discovering the Zambezi River by boat or canoe; marvel at the thirsty elephants at the waters edge, enjoy gorgeous sunsets and enjoy the beauty of this stunning country. Namibia is possibly the best value for money destination in Africa. 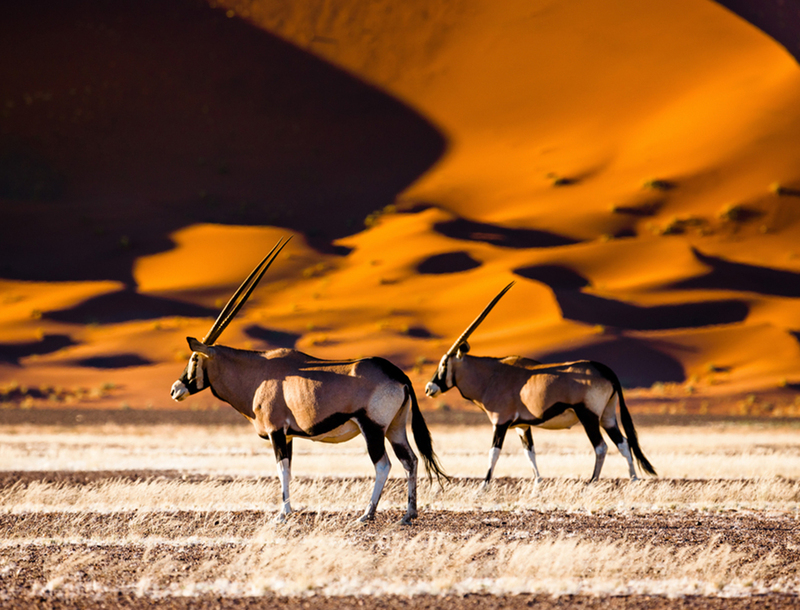 This spectacular country with red sand dunes of the Namib Desert, amazing wildlife across all national parks and an incredible night sky filled with stars; Namibia is truly diverse and one of Africa’s best kept secrets. Unknown as a travel destination to most tourists, Namibia boasts one of the world’s densest wild cheetah populations with over 3,400 out of the 10,000 remaining in the wild, according to Laurie Marker of the Cheetah Conservation Fund. The wildlife doesn’t stop at cheetahs; Namibia is also home to elephants, rhinos, Oryx and plenty more animals. The Etosha National Park and Onguma National Park are our top picks for wildlife viewing. Amongst the Namib Desert there are some of the highest sand dunes in the world, and the best way to experience it all is from above on a scenic hot air balloon ride or light aircraft flight. The desert is so incredibly beautiful, seeing it from above is the only way to cover as much of it as possible in a short time. There’s so much to see and do in Namibia and its great value for money, you can experience, wildlife, the desert and even incredible culture amongst the Himba Tribe. There is truly no reason why you shouldn’t put Namibia on the top of your bucket list this year.